This will go down in history as the losers’ European Council. David Cameron has fashioned a lose-lose game plan in which both the UK and the EU will emerge weaker from his plebiscite politics, writes Denis MacShane. If other EU leaders cave in to his demands for concessions which create a special status for the UK in Europe, leaving it able to discriminate against other EU citizens working in Britain or getting unique rights for the City of London to ignore common EU rules on banking and eurozone integration, this will encourage every other nationalist populist European politician to make similar demands. Cameron is refusing to accept any refugees from the broken states of the Middle East and Libya, which British foreign policy blunders have turned into warzones where everyone is pitted against everybody else. If that is OK for Britain why should any other EU leader heed Angela Merkel’s appeal for quotas and some generosity to these pitiful refugees? According to the French political weekly Le Point, Cameron was the pin-up star at the recent National Council of France’s extreme populist National Front. Marine le Pen said she would follow the UK’s example and demand special treatment for France and even a Frexit referendum on France’s future in Europe. Thus the centrifugal forces in Europe will accelerate if Cameron gets all the concessions he is demanding. In London at Chatham House on Wednesday (17 February), senior Polish politician Krystof Szczerski said that Cameron’s demands that the UK should be allowed to discriminate against Polish workers in Britain in terms of the top-up supplement for low-pay workers was “unacceptable”. Cameron’s idea of paying benefits based on what an immigrant worker would be paid back home appeals to many richer EU member states but is a nightmare for labour exporting EU member states in east and south-east Europe. The governors of the German and French central banks have called for a common eurozone economic, and possibly even fiscal, policy, as has Italy’s finance minister. To allow the UK a special droit de regard and even a potential veto on the currency which UK economists and commentators treat with open contempt stops eurozone integration dead in its tracks. Alain Juppé, who may well emerge as France’s president next year, used his blog on Wednesday to warn François Hollande to “stand firm” against any concessions to Cameron on the right of eurozone governments to determine the currency’s next development without asking Westminster’s permission. So Cameron having launched his zero-sum game of demanding the EU grant the UK not just an official semi-detached status but also the right to mess with other countries’ citizens or interfere in the common currency which Britain spurns with pride, will return home a loser whatever the spin his people put on the final deal. When he was leader of the opposition between 2005 and 2010, Cameron used Europe to beat up Tony Blair and Gordon Brown. He accused them of giving in to Brussels, allowing millions of Eastern Europeans to come into Britain, of making concessions on the EU budget, of refusing a referendum on the Lisbon Treaty and of the endless trading away of British sovereignty. Cameron’s language was music to UKIP and to Conservative party activists who could not work out why Tony Blair kept winning elections and needed attack lines against the Labour government. 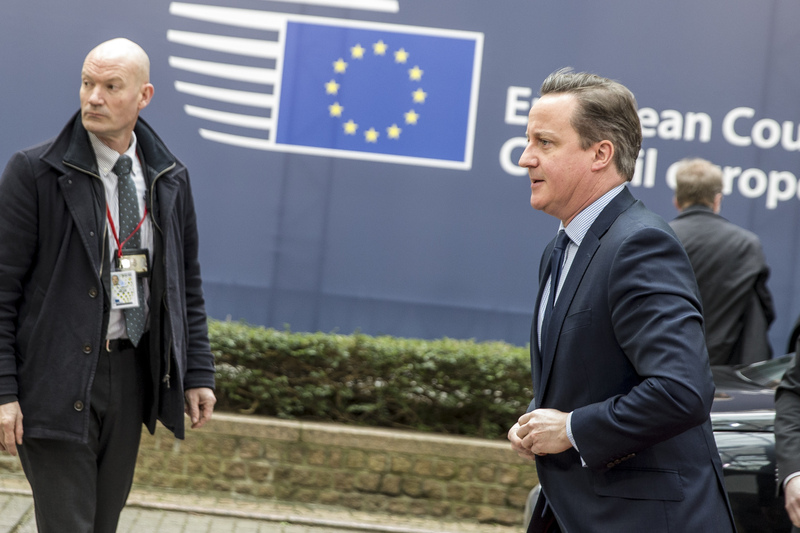 Cameron took the Conservatives out of the European People’s Party and promised a referendum on the Lisbon Treaty – a pledge he broke when he entered Downing Street thanks to the support of the pro-EU Liberal Democrats. Having served his purpose Nick Clegg was dumped in the dustbin of history reserved for politicians who trade principles for a chauffeured government limousine. Now Cameron has to pretend he is a born-again pro-European, the Eurosceptic Saul who has converted himself into the Europhile Paul. Will that wash with his party and the public? If Britain leaves the EU it will be the worst moment of disintegration of the European region since the 1930s. Britain will lose status with the international investment community, with Washington, and be seen as a marginal off-shore island by rising powers like India and China. Europe will lose its most dynamic major economy which knows how to create jobs and which is a global geo-political player. The man rubbing his hands at the thought of a Brexit is Vladimir Putin who hates dealing with the EU as the EU only wants bi-lateral relations with individual nation states when Russia will always be the biggest in the room. Even if Brexit is defeated the dream lives on. Cameron’s cerebral Eurosceptic minister, Oliver Letwin, says this plebiscite is unimportant as the one that counts is the one that takes places after a new EU Treaty sometime in the 2020s. That line is backed by influential Guardian commentator Sir Simon Jenkins, who today says Britain should vote to leave now, renegotiate a deal because the Europeans would fall over to accept British reform demands and then have a second referendum on the final reformed EU. It is the anti-European dream of the English over decades that one day there will be a perfect EU fashioned to meet British prejudices. Win or lose, the campaign for Brexit goes on. David Cameron has started a political chain-reaction which he no longer controls and which is damaging both his own country and the European Union of which he is a citizen. The EU is basically the reincarnated ‘Frankish Empire’, or the reincarnated ‘Holy Roman Empire’, this is already clear from taking a look at the founding nations. It is also clear that the UK only joined to take advantage and sabotage. It resists almost all collective effort and subsequently starts complaining that Europe doesn’t work. We joined because we had one of the biggest idiots in history as PM & we don’t need lectures from people that lost office due to fiddling! Give you right ! During the Roman Empire the citizens lived 300 Years in prosper without waring each other ! We were at that time powerful ! I think England was included ! Yesterday you said Europe was kaput. So why should the UK go down with a sinking ship if they can high line aboard a sturdier vessel. Now has anyone in the EU Parliament actually enquired why the UK is teetering on the brink of exit? Could the reason possibly be somewhere in the labyrinthine maze of the EU where a Minatour hides? Could it possibly be due to previous kickings given to the UK by the EU in revenge for us standing against European Monsters? Could it be due to the inflexibility of EU regulations and Rules which allowed food contamination and the spread of plant pathogens? Could it be due to the emission standards? Could it be due to the inflexibility of the shiboleths of the EU?